The importance of exchanges has contributed to the launch of many tokens that are native to their exchanges. Some of these tokens have seen an incredible amount of popularity and trading volume, such as Binance’s BNB, a token consistently found at the top of the token market capitalization rankings. These tokens usually have a number of benefits for their users like fee discounts, while other tokens function as the only tokens that can be used for an exchange’s token sales. In this overview, we will be taking a look at some of the most well-known exchange native tokens, providing information about their current stats, use cases, important features, and availability and compatibility with wallets. Additionally, some of these tokens haven’t managed to avoid controversy, and we will fill you in on what you need to know before making any investment decisions. The Binance Coin (BNB) is the native coin of the Binance ecosystem. It is built on Ethereum under the ERC-20 standard. It is described as the “underlying gas that powers the Binance ecosystem”, according to the exchange’s official site. Binance is implementing a repurchasing plan. Binance Coin’s total supply was 200 million tokens at the start, but every quarter, the exchange takes 20% of the profits and uses it to buy back BNB and destroy them. This will continue until Binance has purchased back 50% of the 200M tokens issued, eventually leaving 100M BNB in circulation. In addition to the Binance exchange, you can find BNB on the following sites: Dether Wallet, InvestFeed, Kyber Network, and Eidoo Wallet. Since BNB is an Ethereum token, it can be kept and transferred by any wallet with ERC-20 support. There are a significant number of wallets listed on the Binance site: Trust Wallet, Enjin Wallet, Trezor Wallet, Ledger Wallet, Jaxx, CoolWallet S, Metal Vault, BRD, Gifto, Request Wallet, Ethos Universal Wallet, WinQ, Atomic Wallet, Clay, Coinomi, and Blox.io Wallet. Back when BNB launched in 2017, the price of the coin was at $0.115203. By mid-August the coin had passed the 1 USD barrier and it went back and forth a couple of dollars until the price started rising significantly in late 2017, culminating in a peak of $24.91 on Jan. 12, 2018. The price of BNB at press time is $19.09, having experienced a 16,470% growth in the almost two years BNB has been out. The coin started the year at $6.19 and stayed in that range throughout January. February was different, as BNB’s price started to increase steadily, which continued all the way through March, showing a +181% surge in the first quarter of 2019. In January, BNB was the 31st largest cryptocurrency in terms of market cap, and it is currently positioned at #7. On Mar. 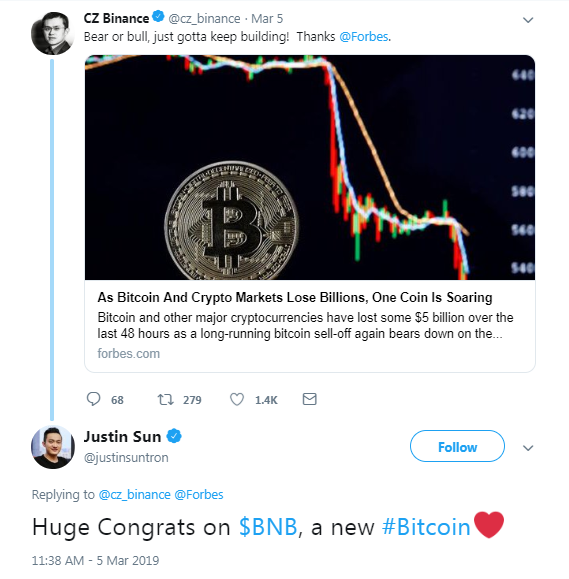 5 Justin Sun—founder and CEO of TRON—tweeted about the coin’s rapid growth this year, and compared BNB to BTC after a Forbes article came out identifying BNB as a “bright spot of green in the now familiar sea of red”, referring to the market’s poor performance during the first week of March. However, amid the hype, voices of dissension rung out on social media claiming that BNB was in fact a centralized security token for an exchange that was breaking US law. The critics claimed that Binance was violating KYC/AML laws by not adapting properly to global regulations. Apparently, Binance has made a name for itself as a “freewheeling, unregulated exchange”. On Mar. 26 however, the company announced a partnership with IdentityMind, a regulatory technology firm that automates and enhances KYC and AML services. Another tweet made accusations against Changpeng Zhao and BNB, stating that the coin “is a fraud controlled by one man”. The twitter account seems to be dedicated to trashing Binance, the BNB coin, and CZ in general, saying he is manipulating the coin’s price and defrauding thousands of people. About a year ago, there was a screenshot of a “giant BNB wall” on the Binance exchange posted on Reddit by someone who was trading BNB. There were suspicions whether this was coming from the exchange itself trying to manipulate BNB’s price by selling huge amounts of BNB to intimidate investors, or if it was something else, leading to questions about Binance’s ethical practices. On a different Reddit thread, one user ranted about the Binance voting system. There’s a listing method wherein one token on the exchange can get voted on without having to pay listing fees. The user states that this strays from the point since it pits different communities (and developers) against each other and collects money at the same time since you need to pay a fee to cast your vote. The Huobi Token (HT) is an Ethereum-based decentralized digital asset, and it was issued by the Huobi Group as the exchange and its ecosystem’s proprietary token. The main use case for the Huobi Token is that it is the only token accepted for purchases done through Huobi Global and the newly-released token sale platform, Huobi Prime. In order to be able to participate in a Huobi Prime sale, users need to have had an average daily holding of 500HT over the 30 days prior to the launch. Additionally, the certification process to become a verified OTC merchant involves the freezing of 5,000 HT as part of a security merchant’s deposit. There is a limited supply of 500M HT, a number that is currently decreasing due to the process of repurchase and subsequent destruction of HT, which was voted into action by the community in December. This means that 20% of the revenue from Huobi contracts and Huobi Global are allocated towards these processes. U.S. residents might not be able to buy HT through Huobi, but other alternatives such as LBank and Gate.io are available. As an ERC-20 token, any wallet that supports Ethereum will be compatible with HT. The HT token has had a successful year, having experienced a 141% rise in price—from $1.07 to $2.58—in the first quarter of 2019. This means that the token has risen 73% in price since its release when it was priced at $1.49. However, this is still roughly 136% below the all-time high price of HT, $6.10, reached in June of 2018. HT was originally distributed as a reward for purchasing Huobi’s Point Cards, but this quickly sparked controversy. According to Twitter comments, the sale was over in record time because big-money investors and bots quickly bought up all of the point cards available, leaving normal investors out of luck. The OKB token is a global utility token issued on the Ethereum platform by the OK Blockchain Foundation. It is part of a token economy system set to connect prospective digital asset projects to OKEx users and investors. The Happy Friday program started on Apr. 20, 2018, and it consists of the following: every Friday, 50% of all fees raised during the week are given back to OKB holders as bonuses. The amount is distributed proportionally to the amount of OKB that the holders own. This project is meant to last two years and it is subject to adjustments should the circumstances require it. OKB’s total supply is 1 billion. So far 300 million OKB have been given away in the OKB Red Packet and Loyalty Point Subscription programs. 30% of the remaining OKB will be given to OKEx users in different marketing events as rewards for continuing to build the community in 2020. 100M OKB are locked up until 2022 and are meant for the future operations of the foundation. Another 100M OKB have been bought by early stakeholders and will be released in 2022. The remaining 200M OKB are for team motivation and starting in 2022 there will be 20M OKB unlocked annually. OKEx: this exchange has the highest concentration of OKB transactions, as it is responsible for 92.8% of OKB’s volume. The remaining 7.2% is on the CoinAll exchange. As OKB is an ethereum-based token, it can be stored in any wallet with ERC-20 support. OKB’s first recorded price is from Jun. 6, 2018. Its all-time high came shortly after on Jun. 19 at $5.42. It didn’t take long for the coin to catch up with the market and the price decreased all throughout the second half of last year. OKB started 2019 at $0.658561 and remained pretty stable during January and most of February. At the end of February, however, the price started to increase slowly but steadily and during March this continued, finally closing the month at $1.86, with a total growth of 182% during 2019’s first quarter. OKB is at $2.30 at press time. Coni (CONI) is a cryptocurrency token developed by the CoinBene exchange. It operates on the Ethereum platform as ERC-20. Launch date: June 7, 2018. They are also planning to launch their own blockchain, which will extend CONI use cases. 10% of CONI’s supply is for a platform security fund to protect its users’ interests. The last 10% was distributed to early investors. CONI’s destruction and buy-back program was created in response to users’ recommendations as a way to help the stability of CONI’s value. The program intends to destroy 400M tokens overtime, eventually leaving 600 million CONI tokens in circulation. In order to make this happen, CoinBene will use 60% of the platform’s transaction fees to buy back CONI and will then proceed to transfer them to a black hole wallet address for destruction. The first phase of the program took place on Mar. 25, 2019, where a little over 2.6M CONIs were destroyed. On Apr. 2 there was another buy-back and destruction and 2.8M CONI tokens were burned this time. The buy-back and destruction program will take place weekly. CONI can only be traded on the CoinBene exchange. As it is a usual ERC-20, it can be stored in wallets that support ERC-20. CONI’s first recorded price is from Jun. 29, 2018. The coin opened that day at $0.132396. Its all-time high was on Jul. 16, 2018 at $0.151007. The first part of the second half of last year was down-hill for the coin, and the last quarter didn’t bring many changes. CONI started the year at $0.008595 and it remained under that amount for most of Q1. During the beginning of March, the coin took a little surge and during March’s second half, the price started to increase noticeably. CONI closed March at $0.048755, experiencing a +467% growth in Q1, 2019. On Mar. 26, CoinBene unexpectedly announced via Twitter that they were doing maintenance on the exchange without providing an estimated completion time and that withdrawals and deposits would be stalled during the process. This sparked suspicions among users, who seemed to believe the exchange had been hacked. The next day, however, CoinBene tweeted that all funds were safe and there was no truth to the hacking rumours. Normal activity resumed shortly after. Data scientists from the firm Elementus published details of suspicious transactions involving $105M in crypto and argued that the pattern of transfers and sequence of events “is consistent with how exchange hacks commonly play out” highlighting the period of inactivity and the large amount of funds withdrawn, among other factors. Ultimately, this affects people’s perceptions of the exchange and the CONI token. There still hasn’t been any confirmation on whether the unexpected maintenance had to do with the platform being hacked, but the demand of the token may fall following these events anyway, causing a drop in the price as well. BitMax Token (BTMX) is an ERC-20 token and operates on the Ethereum blockchain. It is described as an integral part of the BitMax ecosystem where it is used as the primary token of the exchange. Launch date: November 10, 2018. BitMax Token can also be used for auctions in the platform. Their first auction (BOLT) took place in March, and successful bidders were rewarded with 100 USDT. BTMX coin is only distributed by BitMax affiliates, but it can also be purchased on the exchange or obtained through the “Trading Mining” model and other incentives based on the trade volume of a user’s account. The total supply of BTMX tokens numbers 10 billion, with no possibility of further increasing the limit. 49% of the total issuance of BTMX is set aside for pre-distribution purposes, whereas the remaining 51% was set to be released and distributed to incentivize users to participate in transaction mining. The way in which the pre-distribution worked was by unlocking BTMX daily for pre-distribution, following the ratio of 49:51 (51 being the daily mining production output). BitMax Token is mainly available for purchase on BitMax with trading pairs for USDT, BTC, and PAX. However, a trading pair for BTMX/ETH exists on IDEX. As an ERC-20 token, any wallet that supports Ethereum will be compatible with BTMX. The price of BTMX saw a drastic spike in the first quarter of 2019, starting the year at $0.01414519 and then having its price increase 794% to close Q1 at $0.12657. When compared to its initial price of $0.03417091, BTMX has had a 270% price increase since its release. This difference in price spikes to a whopping 798% when we compare BTMX’s initial price and its all-time high price of $0.307045, reached in late March of 2019. KuCoin Shares (KCS) are the native cryptocurrency of the KuCoin exchange. It’s an ERC-20 token, and its main function is that it “allows” users to profit from the success of the exchange thanks to their KuCoin Bonus system. 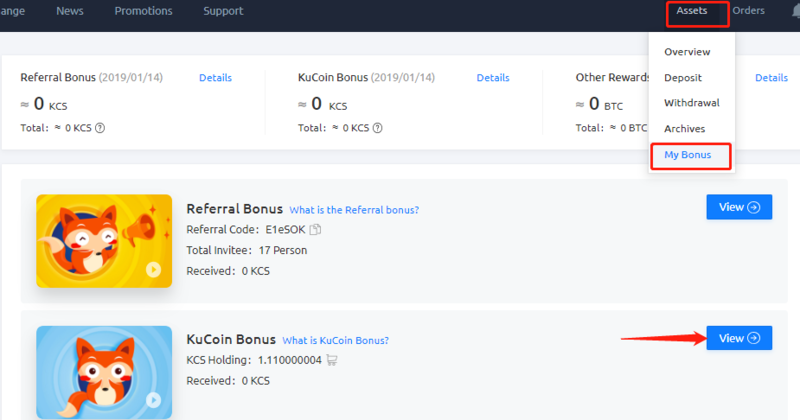 The main use case for KCS is the KuCoin Bonus system, where users get rewarded daily with KCS based on the amount of assets that they hold on their accounts and the trading fees of KCS. 50% of the exchange’s trading fees are allocated towards KuCoin Bonuses. There is also a tiered trading fee system, which also depends on the amount of KCS that a user holds. The base trading fees for both maker and taker are 0.10%, but they can be as low as 0.0125% and 0.03% respectively. KuCoin also has Spotlight token sales, the first of which is the MultiVac project’s MTV token, which started on April 3rd. Users can invite other people to join the exchange, and if they are successful, they get a referral bonus of up to 20% each time an invitee completes an order. A user can invite multiple people, and each referral bonus is effective for one year. The exchange also conducts a quarterly buyback and burn process. KuCoin allocates at least 10% of their quarterly profits into this process, the last of which resulted in the burning of 196,211 KCS. KuCoin Shares (KCS) are only traded on their exchange, but there are several trading pairs available. The exchange has its own wallet for the coin, but any wallet that is compatible with ERC-20 tokens will work. A couple of months after being released, the price of KCS spiked to reach its all-time high of $21.14 on January 7, 2018, which meant a whopping almost 3,000% price increase from its initial $0.69 price. The price of KCS subsequently settled back to its initial price, and it started the year at $0.60. Then the price started to spike again in March, which lead to a 166% rise in the first quarter of 2019 and a closing price in March of $1.66. Launching native tokens is not necessarily the latest trend for crypto exchanges, as it all started a couple of years ago. However, it’s still working. 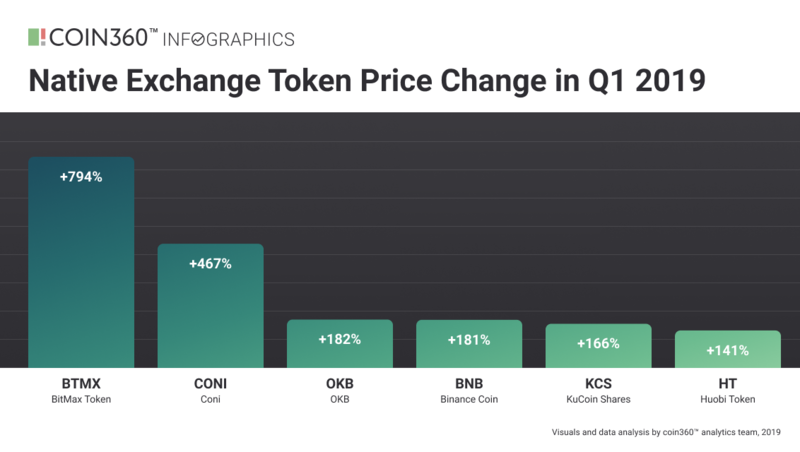 All the native tokens mentioned above have outperformed the majority of other cryptocurrencies in Q1 2019 and have shown significant increases. Native tokens can be a win-win for both exchanges and users. Exchanges, apart from the token sale gains, get a method of long-term user retention, while users benefit from trading fee discounts, bonuses, voting rights and other features offered for holding native tokens. The quickly evolving trend of IEOs (Initial Exchange Offerings) is drawing even greater attention to native exchange tokens, as participation in those sales requires users to hold a certain number of native tokens.